This Feiss Hobson 3 light island chandelier pendant in satin nickel finish with seeded glass shades features retro industrial style, with rectangular ceiling plate, twin rod suspension and pendant bar supporting downward facing lights. The lamp bulbs are housed inside clear seeded bell glass shades, finished with satin nickel trim. Shown here fitted with Edison squirrel cage light bulbs that are not supplied but are available to purchase separately. They can be found by following this link to our vintage light bulbs section. A bright, dimmable LED filament lamp can be found by following this link. Supplied with two 15cm and six 30cm drop rods that must be used in pairs to achieve your desired drop; please see the technical information below for exact dimensions. Perfect for the modern or themed kitchen installed over a dining table, kitchen island or worktop. There are matching fittings available in the Hobson range that include large and medium pendants and also available finished in aged brass; please see below for the complete collection. This industrial light is supplied by Elstead Lighting and designed in the USA by Feiss, founded in New York in 1955. 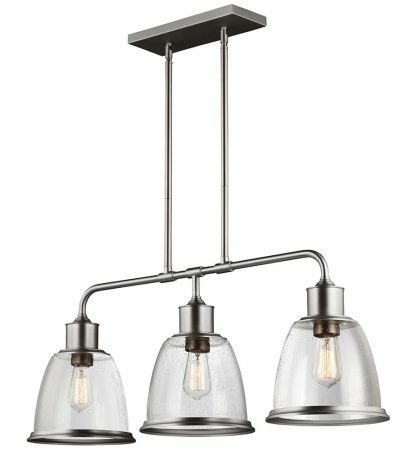 They have become well known over the years for their contemporary yet classic styling, quality and great original designs like the Hobson 3 light island chandelier pendant in satin nickel finish with seeded glass shades you see here.